Should your project require made-to-spec linear bar grilles, our team of craftsmen can create limitless designs, styles, shapes, access points, special flange dimensions, finishes and mounting options while meeting all HVAC and architectural standards. 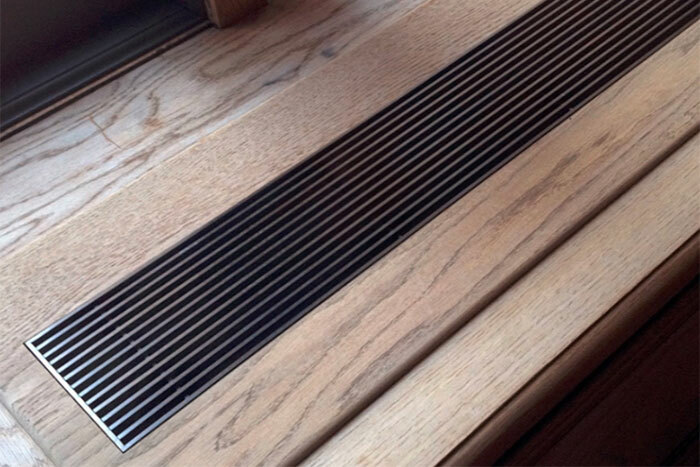 Your linear bar grilles will be fabricated to your exact requirements, quickly and within budget. We can convert ordinary grilles into beautiful decorative HVAC grilles. Floor grates into custom bronze registers accenting your room and decor. Aluminum Plaster J-Bead® grilles blending smoothlessly into your wall. We expertly create linear bar grilles with custom and period finishes for any restoration, new construction or application including floor grilles, wall grilles, perimeter radiation grilles, ceiling grilles, sill grilles, registers, supply grilles, return grilles and wall cladding and decorative screens. Whether your project requires linear grilles that are curved, inside corners, outside corners, mitered corners, customized bar spacing, wall cladding, column wraps or radiused linear grilles, our architectural linear grille professionals are here to help.